Tales of crockpot greatness and other kitchen glory. So this is another in my mini series of apple-type fall treats. In my previous post (check that guy out here) I told you about my apple orchard excursion that resulted in my picking a 1/2 bushel of apples (aka roughly 50 apples!). 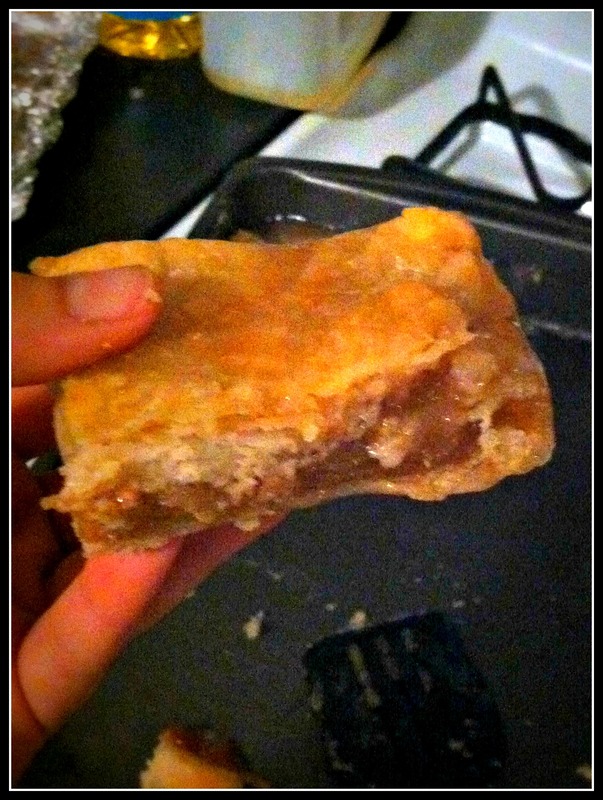 And after baking an apple pie and an apple peach cobbler I still had TONS of apples left over. My friend L was having the ladies over for some TV time one Wednesday night, so I figured I would make a treat for us. Some casual interneting led me to some cool recipes. I decided on this guy: Danish Apple Pastry Bars from Midwest Living. Com (check out the link here). They looked simple enough and more importantly they looked delicious. They have a really yummy crust that is sort short bread like. Beware bakers: these guys are addictive. But a word of advice, READ THE RECIPE CAREFULLY! It is really poorly written. Try my version below for a more step by step approach. 1. Peel, core, and slice all your apples. Place them in a bowl. 2. In a large bowl, combine salt and flour. Using a fork or pastry cutter blend in the shortening until its nice and crumbly. 3. In a liquid measuring cup, add the egg yolk and enough milk to fill 2/3 cup. 4. add milk/yolk combo to the crumbles. When it all comes together it should form a sticky dough. Divide the dough in half. 5. On a well floured surface roll half the dough out into a rectangle the size of whatever pan you’re using. Then put it in the pan (oil/spray it first). 6. Crush the cornflakes and spread them on top of the dough in your pan. 7. Spread your apples on top of the corn flakes. 8. Combine white sugar and cinnamon. Spread over apples. 9. Repeat step 5 and place dough over apple. 10. Spread egg whites over the top layer of dough. 11. Bake at 375 for 25 minutes, then cover with foil and bake for another 30ish minutes until top is golden brown and apples are tender. 12. Combine the powdered sugar and a few TBS of milk to make a glaze. Spread over warm bars. When cooled, cut them into squares and EAT UP! When I made these, the original recipe messed me up and I ended up adding the powdered sugar to the white…yikes…luckily I was able to scoop it out! But lets be serious people, 50 apples is too many…and I STILL had so many left. So I realized that this was the PERFECT time to make some Apple Butter! Which happens to be my next post! Stay tuned!! I reject the notion that pie is a seasonal treat. Fact: I Love Awards Shows.